I am back from a hiatus..was really occupied for the last few months with various issues and could not post in my blog.Really sorry for that..:( Coming to today's recipe..Dosas are really healthy and all of us love them.But many a times we dont attempt to prepare because of the long process..the fermentation part.Actually we forget to soak the ingredients and then its no more an option to have.. :) This happens with many of us.This dosa recipe does not require fermentation and it does not have rice in it.So it is a good breakfast option for people who do not want to have carbohydrates or otherwise.There are various types of dals in it which makes it a protein rich dosa.Here you go..
Wash and soak all the dals for 7-8hours or overnight. Next day grind tha dals with some ginger and green chillies. Add some sooji/rava to it and salt a sper taste. Let the mixture stand for around 15min. Drizzle some oil on it. 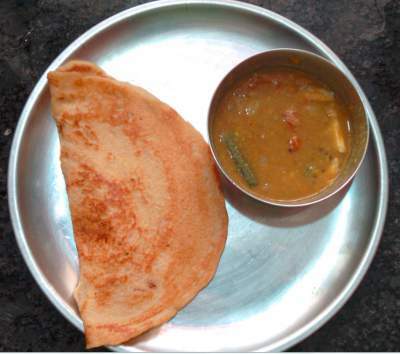 Pour a laddle full of batter and make circular dosas. Cook on medium flame till light brown. Crispy dosas are ready to server with sambar/chutney.